Nobel Prize winner Gunnar Myrdal is best known for his book An American Dilemma, a classic study of America’s racial problems that was chosen as one of The Modern Library’s top 100 nonfiction books of the twentieth century. 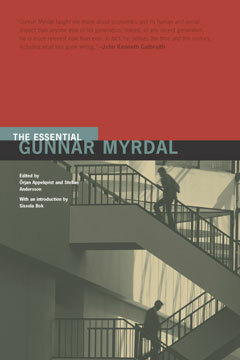 The Essential Gunnar Myrdal covers the full range of Myrdal’s writing, much of which has never been published in book form. It includes his early essays on economics, his thoughts on the population explosion, his discussions of the question of value in the social sciences, and excerpts from Asian Drama, his monumental study of the development of Asia. The newest edition in The New Press’s Essential series, the book includes extensive commentary by the editors as well as an introduction by Sissela Bok, who is Myrdal’s daughter and author of the acclaimed Lying and Secrets. Gunnar Myrdal (1898–1987) won the Nobel Prize in Economics in 1974. His books include An American Dilemma, Asian Drama, and Challenge to Affluence. Stellan Andersson is an archivist at the Labour Movement Archives and Library in Stockholm. He is a co-editor, with Örjan Appelqvist, of The Essential Gunnar Myrdal (The New Press).